On Tuesday evening I walked around my house like a hormonal pregnant woman, bitching that it was hot. In my defense it was 78 degrees in the living room at 5 pm. The afternoon had been in the upper seventies, maybe even low eighties. We opened windows and turned on ceiling fans and I couldn’t get cool enough. We had chicken and a big salad for dinner. A strange day for a November in North Carolina but I embraced it. In fact, I was moved to paint my toenails. Barefoot and pregnant in the Cackalackey. November, be damned. At nearly 32 weeks pregnant it was a thrill to reach my own feet. Even if I had to bring my feet and toes up in to my lap, contorting myself on the couch seems preferable to just leaning down lately. However it had to be done, it happened. I painted my own toenails. And Thanksgiving and Christmas and The Baby seemed a million miles away. Last night I snuggled up on the couch. Under two blankets and I kicked the fireplace on. Em and I looked at recipes for Thanksgiving and planned out potential holiday desserts. (She continues to campaign heavily for donuts, silly kid.) I sent Em up to pick out her books for bedtime. Among the books she chose was last year’s copy of “T’was the Night Before Christmas.” This morning the sheets felt cool when I slid my legs over the side of the bed. 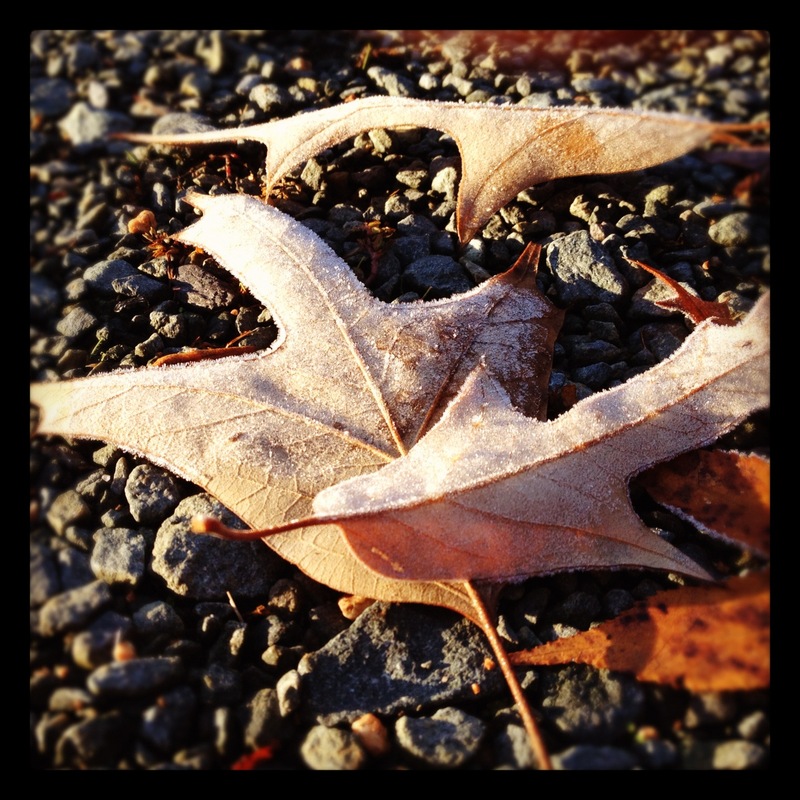 There was frost on the ground and the last of the leaves have fallen from the crepe myrtle. Warm socks and corduroys and turtleneck sweaters. Tonight I will make meatballs for dinner and we will snuggle up as a family and watch a movie. Our first Friday night in the new house, just the three of us. Eight more. We have eight more Fridays between today and our due date. Eight Fridays. Thanksgiving, Christmas, New Year’s and a few birthdays in there somewhere, too. Two Charlie Brown specials and Jimmy Stewart’s “It’s a Wonderful Life.” Order plantation shutters and get them installed. Bring down all the Christmas decorations, put them all up and then take them all down and put them back in the attic. There’s a lot to do in the next eight weeks. Plenty of time. But only eight Fridays. Eight nights with my feet in MQD’s lap , my skinny-mini little girl curled up next to me. A movie we have seen a thousand times playing on the television. I don’t get to hold her in my arms often anymore. I’d watch anything just to hold her, smell the back of her neck, feel her freezing little feet up against me for 90 minutes. Nine Fridays from now my arms will likely be full. Of a brand new baby. And as prone to the drama as I am even I must remember that Em won’t be headed off to college. She will be glued to my side, quite likely. Falling in love with her baby brother or sister just like me and MQD. The eighth Friday is January 13th. Seven years earlier on January 13th I found out I was pregnant with Emily and my whole world changed. I was going to be a mom. And now I will be a mom all over again. They say no two kids have the same mother. I hope I like being this kid’s mom as much as I have loved being Em’s so far. Emily’s mom is strong and unafraid of change, in spite of all of her insecurities and her best efforts to get in her own way. Emily’s mom became MQD’s wife. This kid better turn me in to Wonder Woman to top all that. This entry was posted in Family, Parenting, Pregnancy and tagged Emily, Pregnancy, Weather. Bookmark the permalink.